Bob Maylie, of Northeast Philadelphia, yells with excitement as the Philadelphia Eagles choose Derek Barnett with the 14th-overall pick in the 2017 NFL draft, Thursday, April 27. NFL Commissioner Roger Goodell stepped to the podium at 9:51 p.m. Thursday to announce the Eagles' first round selection in the 2017 NFL Draft. 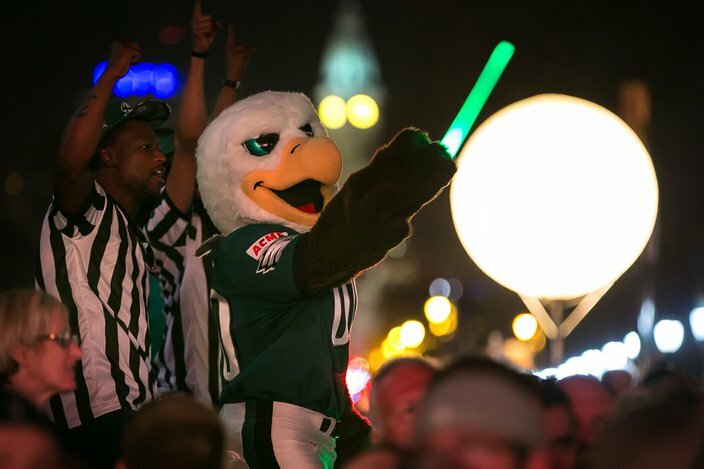 For nearly two hours, thousands of Eagles fans had cramped together at Eakins Oval on the Benjamin Franklin Parkway, eagerly awaiting this moment. Silence briefly permeated the crowd as Goodell began to speak. The selection: Derek Barnett, a defensive end from Tennessee. The reaction: A collective groan, mixed with hesitant cheers and scattered boos. Many Eagles fans immediately turned away from the stage, constructed on the steps of the Philadelphia Museum of Art, and headed for the exit in frustration. Others lingered, trying to understand why the Eagles selected Barnett when talented players that seemingly better fit their needs remained on the draft board. 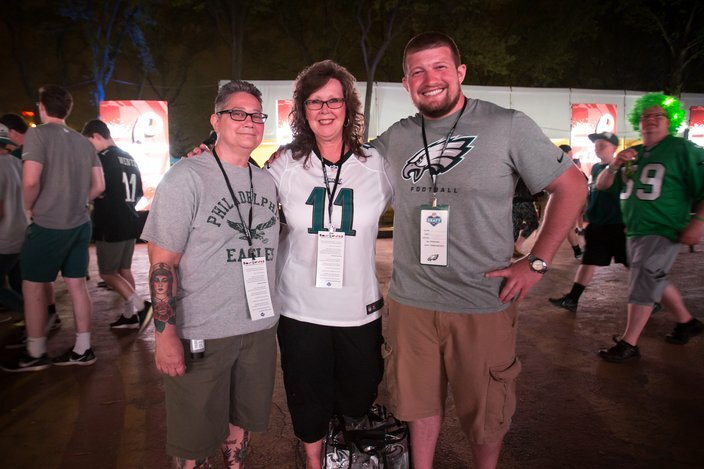 Philadelphia Eagles fans, Michele Ziccardi, Barbara Ziccardi and Ryan Harrington, (L to R), spoke to PhillyVoice shortly after the Eagles chose Derek Barnett as their first pick in the 2017 NFL draft, Thursday, April 27, 2017. Ryan Harrington, an Eagles fan who traveled from South Bend, Indiana to attend the draft, called the pick a surprise. "I thought there was more talent at the running back position," Harrington, 25, said. "It's kind of weak and Dalvin Cook was on the board there. They say draft based on the best player on the board. Apparently, this guy was it." Three quarterbacks and three wide receivers were selected before the Eagles drafted Barnett with the 14th-overall pick. That left many fans expecting the Eagles to select a number of players that might address areas of need. "We figured it would be a choice of two or three" players, said Jeff Morris, 57, of Newark, Delaware. "He wasn't one of them. I feel bad for the guy because now everybody booed him and he thinks he's not wanted." Football fans packed in tightly to watch the 2017 NFL draft, held on the steps on the Philadelphia Museum of Art, Thursday, April 27. Yet, Morris conceded he wasn't happy with the selection, hoping they would have selected Cook, a running back from Florida State, or Reuben Foster, a linebacker from Alabama. "I don't think they need him," Morris said. "They have three other defensive ends. They have other needs." But not everyone was discouraged by the pick. "I'm very glad," said Bob Maylie, of Northeast Philly. "We need defense." Barnett recorded 198 tackles and 32 sacks in a three-year collegiate career with the Volunteers. He was considered one of the best pass rushers available. Jared Rush, 23, of Langhorne, Bucks County, called Barnett's selection a "good pick," even if Foster was still on the board. "Vinny Curry is probably not that good," Rush said. "(Barnett is) going to be a stud. He's going to help (Fletcher) Cox tremendously and (Brandon) Graham." Swoop was in attendance and cheered on the crowd in the VIP area of the 2017 NFL draft in Philadelphia. As many fans headed home for the night after the Eagles' selection, Matt Cunningham, 17, of Warrington, Bucks County, lingered at Eakins Oval. 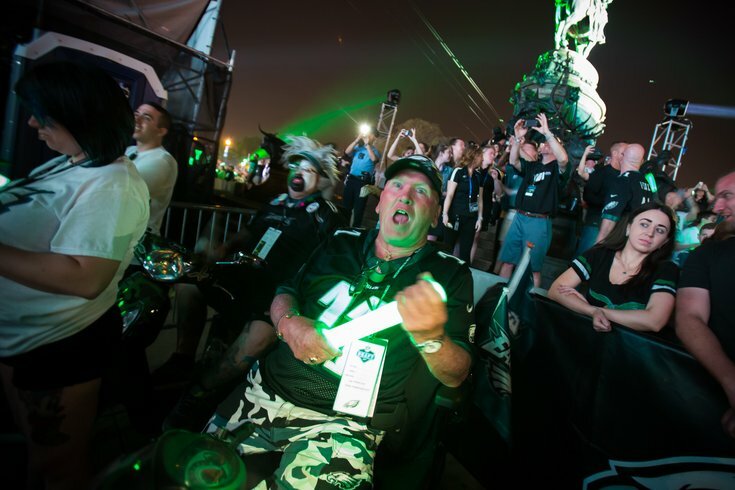 The draft atmosphere along the Benjamin Franklin Parkway was "awesome," Cunningham said. 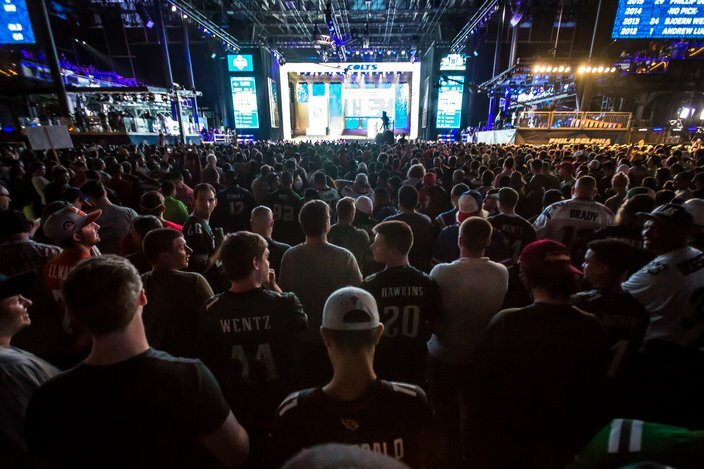 Throughout the night, fans had reacted with cheers and, occasionally surprise, at the player selections Goodell announced. Goodell, of course, was booed every time he stepped to the microphone. "Everybody's so into it," Cunningham said. "It's great." But Cunningham was still scratching his head over the Eagles' selection of Barnett. "They said at the beginning that they were going with the best talent available," Cunningham said. "I thought they should have taken someone else."